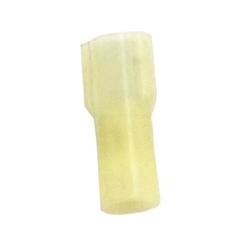 Terminal Quick Disconnect 1/4" Female Fully Insulated Nylon Yellow TMR ST165 Bag of 100. Solderless Terminal Quick Disconnects allow for quickly connecting or disconnecting a terminal. The front end of the terminal has a female-type receptacle which allows the terminal to slide onto and off of a male blade.